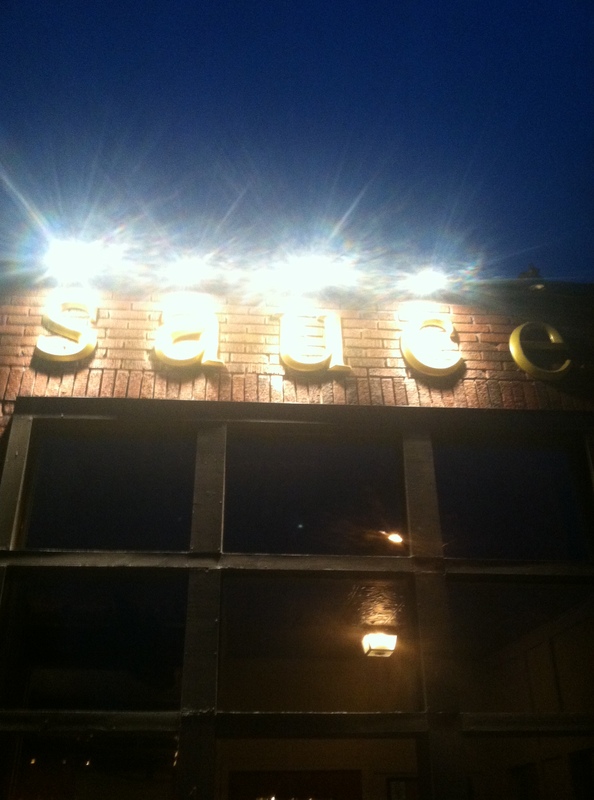 Sauce is a finer dining restaurant with a great atmosphere, food, and drinks. We wanted to give Cedar Rapids something they have not had before and that everyone could enjoy. Sauce’s menu is entirely seasonal and that will be reflected in the dishes we serve, to the wines and drinks we recommend. We work with as many local providers as possible to source our menu. We are not looking to cut corners, especially with the quality of our products. After a pre meal beer at Lion Bridge, (Sorachi Liberaci x 3), we headed up a block or two to Sauce. 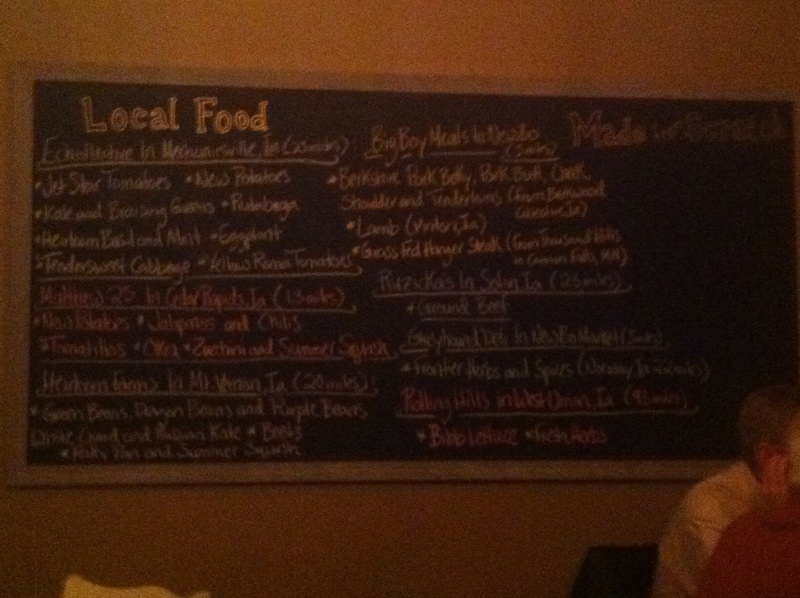 Upon entering, we noticed the chalkboard that listed all the local farms where the produce, fruit, and meat comes from, and another chalkboard on the opposite wall showcasing the local beers that are on tap. Drink local, eat local always appeals to us so we were excited to see the menu. The dinner menu is ever-changing, I think the lunch menu might have a more set options,actually, here’s a link to the lunch menu: www.crsauce.com/menu.html, but everything sounded tasty. We started with an appetizer of chicken fajitas with a sriracha creme fraiche, paired with Turner Alley Pils and that plate didn’t stand a chance. 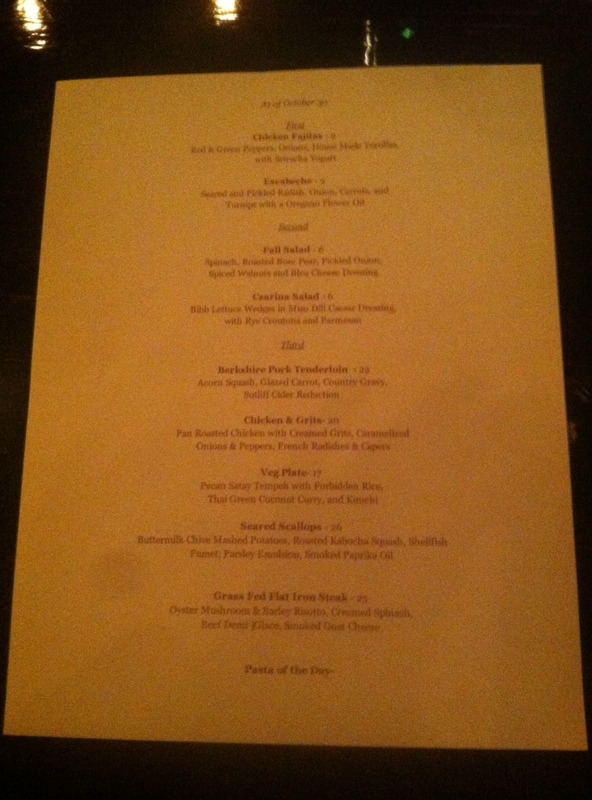 Main course was a little difficult to choose because all the options sounded great. My wife decided to go with the special which was a Berkshire pork ragu with mustard greens over top of tortellini I believe. It was excellent, filling, and fresh. I ordered the seared scallops which were served on a bed of buttermilk chive mashed potatoes, and smoked paprika oil DELICIOUS! Paired my scallops with another Sorachi Liberace from Lion Bridge and I was as close to a food/beer coma as you can come. Overall, the wait staff was very knowledgeable and friendly. The room was a bit dark (sorry about the pictures), but was a perfect setting for a date-night evening. Will I go back? Absolutely, and I can’t wait to see what’s on the menu next time!